A dental crown solves several oral health problems, improves the look of a tooth, and is a great fix for many problem teeth. Dental crowns are an excellent way to fill a gap or strengthen, repair, and protect a tooth! 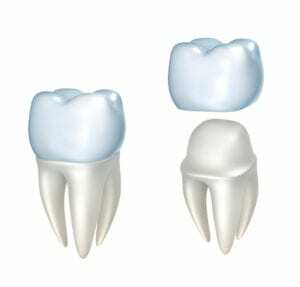 Essentially, a dental crown is simply a tooth-shaped cap used to cover a tooth or to use in place of a missing tooth. A dental crown restores the strength, size, shape, and appearance of a tooth or teeth. Dental crowns are available in a range of materials including metals and all-resin. 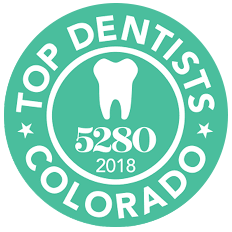 At Barron Family Dental in Thornton, CO, we use only use dental crowns made of full porcelain. Using a crown with any metal content can show gray at the gum line, which ages patients unnecessarily and isn’t attractive. Barron Family Dental crowns are made of porcelain that is a superior material, is strong, and looks like your natural teeth. Crowns are durable to provide patients with full functionality of their teeth. Patients also find they can talk and eat better and without discomfort when a dental crown has been placed over an inadequate tooth. Large fillings: Some cavities have caused damage to up to half the width of a tooth and require a large filling. If this is the case, a crown becomes necessary to strengthen the tooth and avoid it fracturing under stress. Cracked or broken tooth: Patients who have had a fracture inside the tooth can experience pain when chewing. A crown is needed to keep the tooth together, avoid further cracking, and minimize the biting pain. Root canal: Because a root canal hollows a tooth, it can leave the tooth weaker so it may crack over time. A dental crown offers protection after a root canal procedure. Wearing teeth: Some patients suffer from grinding or clenching their teeth, known as bruxism. Over time, a tooth can be completely worn out or worn down, rubbing off the tooth’s enamel and exposing the soft dentin. A crown is used to protect teeth and restore functionality. Cosmetic: Dental crowns are sometimes an option to cover discolored or misshaped teeth. A dental crown can also be used to cover a dental implant or help teeth look more attractive and uniform. Barron Family Dental is highly experienced in dental crown procedures, along with the other options available to help teeth remain strong and healthy. Our team uses the latest dental technologies in the most comfortable and relaxing environment to keep our patients looking and feeling great!